Summary: Researchers have discovered a neurotoxin linked to a range of neurodegenerative diseases in Lake Winnipeg. The neurotoxin, BMAA, is found in high concentration in Cyanobacteria during periods of bloom. 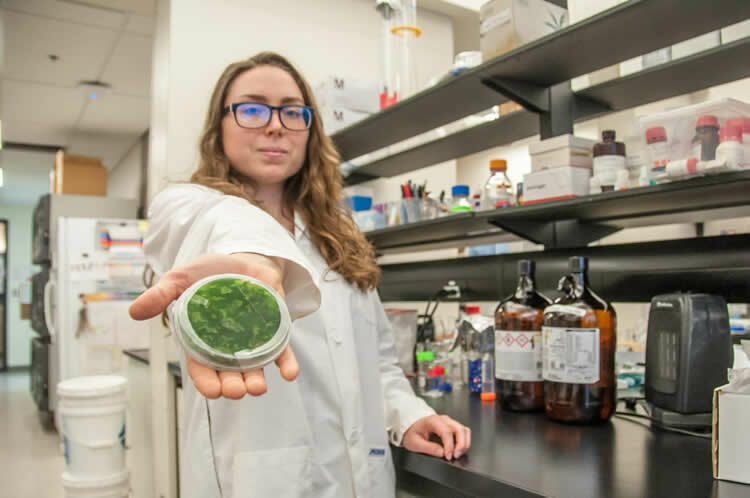 A new study from UBC’s Okanagan campus has found that BMAA–a toxin linked to several neurodegenerative diseases–is present in high concentrations during cyanobacteria blooms in Lake Winnipeg. Stephanie Bishop, a graduate student in chemistry at UBC Okanagan, holds a sample from Lake Winnipeg. NeuroscienceNews.com image is credited to UBC Okanagan. Funding: The study was published recently in Neurotoxicity Research with funding from the Natural Sciences and Engineering Research Council of Canada, the Canadian Foundation for Innovation, and the Canada Research Chairs program. Image Source: NeuroscienceNews.com image is credited to UBC Okanagan. UBC “Neurotoxin Discovered in Lake Winnipeg.” NeuroscienceNews. NeuroscienceNews, 29 November 2017. UBC “Neurotoxin Discovered in Lake Winnipeg.” http://neurosciencenews.com/lake-winnipeg-neurotoxin-8052/ (accessed November 29, 2017). Cyanobacterial blooms have affected Lake Winnipeg since the mid-1990s due to an increased phosphorus loading into the lake, which has been exacerbated by stressors such as climate change and eutrophication. Aquatic ecosystems involving cyanobacteria have been found to contain N-β-methylamino-L-alanine (BMAA) and 2,4-diaminobutyric acid (DAB), non-protein amino acids that are associated with neurodegenerative disease, as well as two of the naturally occurring isomers, N-2(amino)ethylglycine (AEG) and β-amino-N-methylalanine (BAMA). We hypothesized that the cyanobacterial bloom in Lake Winnipeg produces BMAA and/or its naturally occurring isomers. Samples of cyanobacteria were collected by the Lake Winnipeg Research Consortium from standard sampling stations and blooms in July and September of 2016 and were analyzed for BMAA, DAB, AEG, and BAMA using previously published validated analytical methods. BMAA and BAMA were found in the highest concentration in the center of the north basin, the deepest and lowest-nitrogen zone of the lake, at an average concentration of 4 μg/g (collected in July and September 2016) and 1.5 mg/g (collected in July 2016), respectively. AEG and DAB were found in the highest concentration in cyanobacterial blooms from the nearshore region of the north basin, the slightly shallower and more nitrogen-rich zone of the lake, at 2.1 mg/g (collected in July 2016) and 0.2 mg/g (collected in July and September 2016), respectively. These findings indicate that the production of non-protein amino acids varies with the depth and nutrient contents of the bloom. It is important to note that we did not measure food or water samples directly and further study of the Lake Winnipeg food web is required to determine whether BMAA bioaccumulation represents an increased risk factor for neurodegenerative disease in the region.